The Nantucket Blue™ Hydrangea, known for its luscious blue blooms, has become a staple in the Garden Debut® line. Approximately 135,000 are sold per year as garden enthusiasts flock to the nearest retailer to purchase the blooming beauties. It’s finally springtime, and many are looking forward to seeing those unmistakable blue flowers, but some may be in for a surprise. What happens when your Nantucket Blue™ Hydrangea blooms pink? Hydrangeas are unique in the fact that their blooms have the ability to change color based on the availability of aluminum in the soil in which they are planted. Aluminum is available to the plant only in low-pH soil. The pH scale, which measures the concentration of hydrogen ions, ranges from zero to 14, with lower numbers representing acidity and higher numbers representing alkalinity. For example, lemon juice ranks 2.0 on the scale (highly acidic), while baking soda ranks 8.5 (highly alkaline). 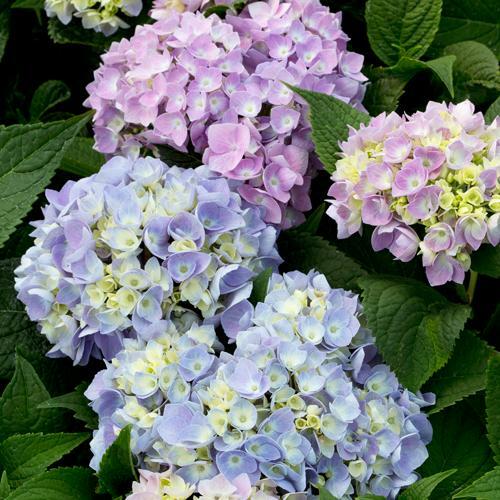 Acidic soil, where aluminum is available, will cause the Hydrangea to bloom blue, whereas more alkaline soil will produce pink petals. It all depends on the amount of aluminum the plant is able to absorb through its roots. Though no less beautiful, it may be a shock for the Nantucket Blue™ Hydrangea to bloom pink. However, many times it’s easy to turn those pink imposters back to blue, should one so desire. Simply squeezing a few lemons or limes over the plant somewhat raises the acidity level of the soil, consequently turning the blooms from pink to blue. Also, most garden supply stores sell “plant food” that will specifically raise or lower the soil’s pH level, based on which variation is purchased. Remember: high acidity equals blue blooms, while low acidity equals pink petals.